Orlando is home to a multitude of fun activities for children of all ages. Although this major city is known for theme parks like Disney and Universal Orlando, there’s much more to experience! Theme parks can be difficult for large school groups or youth groups to maneuver and aren’t always best suited for an educational agenda. Falcon Charter Bus Orlando will get your school group or youth group around the city and surrounding area for the best field trip experience. Call us at 407-274-9808 to find the perfect charter bus for your school day out in Orlando! Educators planning a field trip in Orlando have plenty to choose from beyond flashy theme parks. Theme parks aren’t always the most group-friendly destinations when chaperones are needing to keep up with dozens or even hundreds of students. Students from the local area may have also already experienced their fill of Disney World, Universal Orlando, and similar theme parks. Choosing a smaller attraction will make it easier for chaperones to manage supervision. Don't worry, cutting out theme parks doesn’t mean cutting out the fun. We’ve compiled a concise yet helpful list of attractions for educators and field trip planners to utilize. Traditional yellow school buses offer little comfort for travelers, while charter buses offer extra comfort and amenities for the ultimate travel experience. Falcon Charter Bus has access to over 800 buses across the Southeastern region. This network of buses includes models with additional amenities to keep everyone entertained. Students can play games with on-board WiFi or enjoy a movie on televisions equipped with DVD players. Rather than traveling in warm, muggy school buses, students can relax in plush, reclining seats with climate-controlled interiors. Large groups made up of multiple classes can rent a full-sized motorcoach for their trip around Orlando. These spacious buses can fit up to 56 passengers, making them perfect for field trips. If your school group is particularly large, our rental experts can help your school build a custom fleet to get everyone around town. Smaller groups going on an Orlando excursion can choose from multiple models of minibuses, which fit up to 25 passengers. If you aren’t sure what type of bus is best for your school trip, our rental experts can help you find the best bus option. Orlando and its surrounding cities have various art centers and history museums for both tourists and locals to enjoy. These attractions often have special programs or educational events for schools and youth groups. Established in 2007, the Orlando Museum of Art is a small but mighty center with permanent collections including contemporary American work, African art, and ancient art from the Americas. The museum also features rotating exhibitions from international artists. The Morse Museum is well-known for housing the most extensive collection of Tiffany glass and work from artist and designer Louis Comfort Tiffany, the first Design Director of luxury powerhouse Tiffany & Co. One of the most popular pieces is the Tiffany Chapel created by Comfort for the 1893 World’s Columbian Exposition in Chicago. Located on Merritt Island, just west of Orlando, The Kennedy Space Center sits at the intersection of history and science. The Kennedy Space Center gives students a unique educational experience with interactive learning opportunities, including a bus tour of historic launch sites and meeting an astronaut. This exhibition goes beyond the cinematic representation of Titanic’s demise in 1912. Visitors can explore a 20,000 square foot interactive museum that includes around 400 artifacts from the ship’s wreck, along with an actual piece of the Titanic’s hull. This unique resort offers visitors an up-close aquatic experience to swim with dolphins, meet birds in a free-flight aviary, explore coral reef habitats, and more. Discovery Cove is a limited-access resort, meaning only about 1,300 guests are allowed per day to optimize everyone’s experience. The Leu Gardens sit on 50-acres of land in Orlando along Lake Rowena and includes the Leu House Museum, a beautiful historic space. School groups can explore over 40 collections of plants, with the rose garden and butterfly garden being among the most popular. Focused on interactive learning and innovation, the Orlando Science Center has exhibits ranging from topics on natural science to modern technology. Students can enjoy hands-on activities, 3-D theatre experiences and live science demonstrations. Located at ICON Orlando 360™, the museum exhibits around 500 real animal skeletons for visitors of all ages to learn from. The museum also offers educational activities based on age groups. Little ones can learn about how animals move based on their skeletal features, while older students can explore forensic science and animal pathology. Sometimes, kids just need to have fun! These attractions still possess educational opportunities but may put entertainment above all else. Although Gatorland puts an emphasis on gators, there are various other animals and experiences for students to enjoy at this authentic Florida attraction. Gatorland has gator wrestling shows, a zip line, and up close encounters with smaller critters. This relatively new entertainment complex contains several attractions, shops, and restaurants. 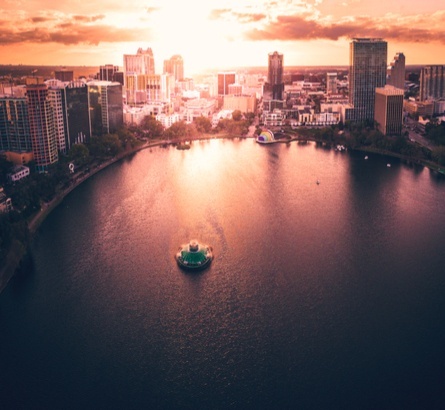 Students can ride on the largest observation wheel on the East Coast, explore intricate wax figures at Madame Tussauds, learn about aquatic animals at SEA LIFE Orlando Aquarium, and soar on the tallest Star Flyer in the world. Entertainment and education come together for over 100 interactive experiences at WonderWorks. Students can experience a simulated natural disaster, play laser tag, and trek through a glow-in-the-dark ropes course. Your school group or youth group will have a blast at one of these many attractions. Renting a private charter bus through Falcon Charter Bus is the best travel choice to keep your school field trip on schedule. We’ll pair your group with the best charter bus option and professional driver for your educational day out in Orlando. Our rental experts are available around the clock to help you throughout the rental process. Call us today at 407-274-9808 to chat with an expert about your Orlando school trip. We’ll get you a free, personalized quote for your school or youth group.